The five-coin Mythical Creatures series from British Indian Ocean Territories concludes with a coin featuring a dramatic image of a centaur. 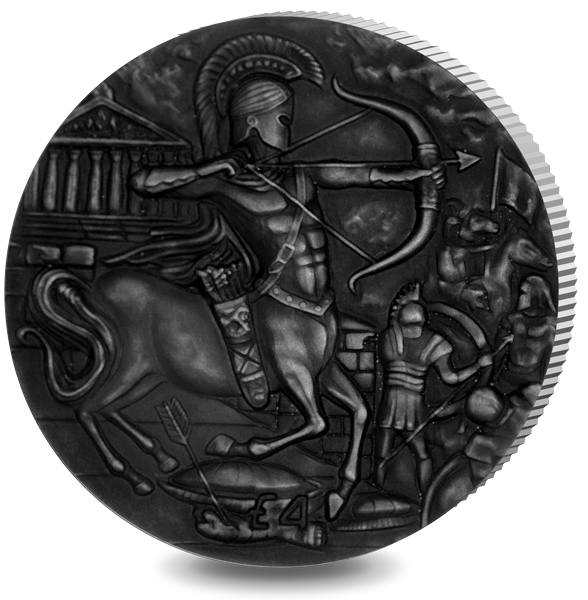 The image on the 2oz Fine Silver coin, released by Pobjoy Mint, features an image of a Centaur taking part in an Ancient Greek battle. The design also shows other Greek soldiers and a Greek style building in the background. The high relief and antique finish effects on the coin help bring the mythical character to life, emphasising the powerful nature of his striking body. In mythology, Centaurs are half-human, half-horse creatures from Greek tales, with the torso, head and arms of a man and the body of a horse. They were thought to be the offspring of Ixion, King of the Lapiths, and Nephele, a cloud made in the image of Hera, but as with all Greek myths there are various theories. Although most centaurs were depicted as lustful and wild, one of the best known centaurs is Chiron, a wise centaur known for his medicinal skills and teaching abilities. To order the coin, visit the Pobjoy Mint website.